Kappa Delta Rho was founded in 1905 at the Middlebury College. The fraternity boasts 38 chapters and has several notable alumni who have held high public office as well as excelled at art, music and athletics. The fraternity has provided over $75,000 in support of various causes. Many alumni have advocated its causes and helped fund many supports. Being part of this fraternity is a real honor. 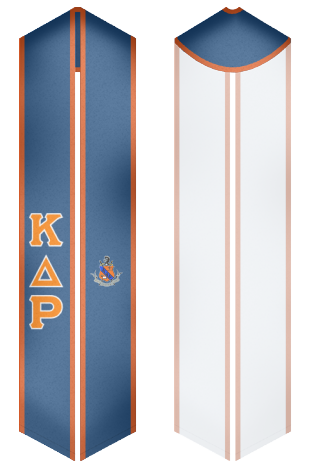 What better than to show your allegiance by wearing a stole or sash designed with your fraternity in mind. Make sure you look through our pre designed sashes and order your sash. You can also design your own sash and make your day special.